Paper and Ink Playground: Happy 40th Denise & May Arts Giveaway...again! Happy 40th Denise & May Arts Giveaway...again! If you participate in the CAS challenges on SplitcoastStampers than you know Denise aka resqbarbie. Denise co-moderators the challenges with Jen. Denise celebrates her 40th birthday this week. Woo, Hoo...oh to be 40 again! I think we just come into our own at that age. I think this sentiment is perfect! Happy Birthday, Denise! Hope you celebrate "in full bloom"!! I paperpieced the hat, dress and bunny. Little pearls accent her hat and shoes and did you see the bunny's tail? The carrot was placed in her hand by cutting around the hand then re-gluing (is that a word?) it down agin. Now, head on over to the May Arts blog. It's Pink Scrap Can Giveaway time! 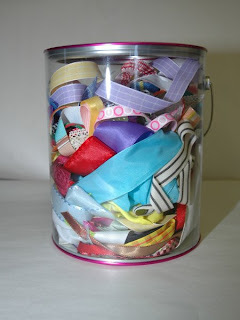 Check out the details on how you can win all of these yummy ribbons!